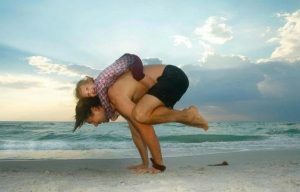 Bring your Dad to Yoga Class on Father’s Day…for free! In celebration of Father’s Day on Sunday 19th June we would like to invite you to come to class and bring your Dad for free (this includes any father-figure in your life!). This is a fabulous opportunity to share the amazing benefits of yoga with the men in your life. Perhaps your Dad or the Father-figure in your life has been interested in starting yoga or mentioned they would like to give yoga a go one day. Well, this Sunday is the perfect opportunity. Simply book yourself on to your desired class as normal (we envisage classes will be busier than normal so please remember to book in advance) and bring your Dad or father figure with you. Please note the sessions are free, however we will require the attendees to complete a form upon arrival at the studio. The free class cannot be booked in advance or online and are drop in only. The free classes are subject to available space, so please ensure you arrive 15 minutes before the class on Sunday. All free attendees must be accompanied by one paying adult. One free person with each full paying adult only.